The first Oliviero was created in 2000 and immediately became an international success as a mass-produced product that met the needs of the professional, but also appealed to the market of small and medium-sized olive growers. 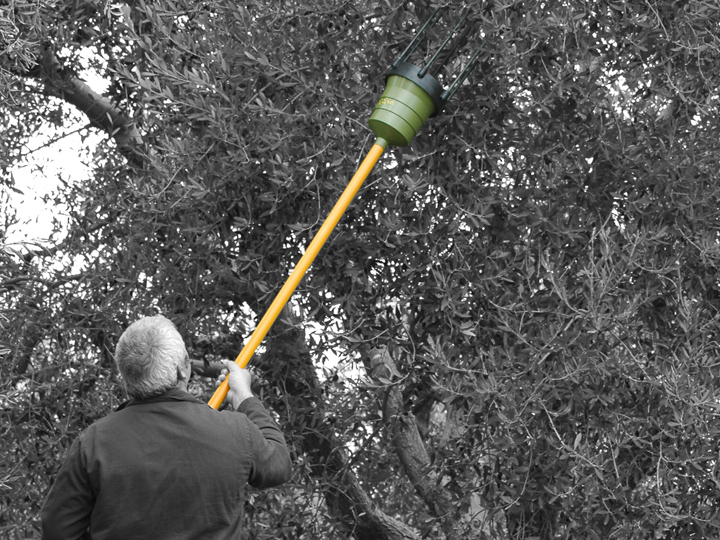 Today, the “Oliviero” brand is recognized globally, almost as a synonym for electromechanical olive harvesters. The birth of this product revolutionized the collection system of small and medium-sized olive growers, increasing productivity with a drastic reduction in work times. Oliviero Evolution, Oliviero Synthesis, Oliviero E-Tech and Oliviero L-Tech. Over the last decade, the spread of mechanized harvesting has led to a demand for niche products that are increasingly targeted and specific for every type of olive grower. Agritec, from the beginning, responded to the needs of small producers, the “Sunday” grower, the retired and woman growers, who could get the job done with the “Oliviero Light”. One of the evolutions of the traditional “Oliviero” patent, it was aimed at enhancing ease of use, lightness and balance and providing ease of handling with minimum noise. Over the last two years, alongside the traditional “Oliviero” range, we’ve developed the “Flex”, an electromechanical harvester with distinct professional features. Its highly technological features allow it to offer the best performance on the market with tips that exceed 200Kg/h. The Flex, Agritec’s foray into the professional market, fully reflects the company’s philosophy, which focuses on constantly designing and implementing new products with remarkable innovative and technological upgrades.